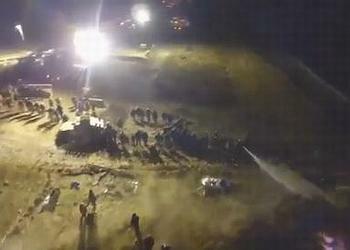 MANDAN, North Dakota, November 20, 2016 (ENS) – North Dakota police and Morton County sheriffs are dealing tonight with what they are calling “an ongoing riot” in connection with the Dakota Access Pipeline. Authorities estimate around 400 protesters are on the Backwater Bridge, attempting to go north on Highway 1806. They say protesters have started a dozen fires near the bridge. The demonstrators say they are trapped on the bridge. Officers are using water cannon in sub-zero temperatures, piercingly loud LRAD sound devices, concussion grenades, rubber bullets and tear gas against the protesters. Armored humvees are on the scene, according to live reports on social media. The 1,200-mile, four-state pipeline is nearly completed but for a section that would pump crude oil under Lake Oahe, a Missouri River reservoir in southern North Dakota. The Standing Rock Sioux Tribe fears that a pipeline leak could contaminate the drinking water on its nearby reservation and says the project also threatens sacred tribal sites. The Backwater Bridge has been the site of many confrontations between protesters and police and hundreds of arrests over the past few months as the Standing Rock Sioux Tribe and their supporters make their objections to the pipeline known. Tonight’s clash is happening just north of the long-standing encampment of hundreds of Native Americans and others protesting the routing of the Dakota Access oil pipeline under a source of drinking water and the destruction of their sacred sites. Law enforcement had formed a line to prevent the movement of people north on Highway 1806, and they appeared to be using water cannons as temperatures dipped toward the low 20s. The company building the pipeline, Dallas-based Energy Transfer Partners, has continued work on the line even as representatives of the Army Corps of Engineers and the Department of the Interior met November 17 in Rapid City with Chairman Dave Archambault of the Standing Rock Sioux Tribe, Chairman Harold Frazier of the Cheyenne River Sioux Tribe, and other Chairmen of Northern Plains tribes to discuss the necessary Environmental Impact Statement for the pipeline. North Dakota regulators have criticized Energy Transfer Partners for not immediately reporting the discovery of Native Indian artifacts. President Barack Obama has raised the possibility of rerouting the pipeline to alleviate tribal concerns. The head of the company building the Dakota Access oil pipeline said Nov. 18 that it won’t be rerouted but that he’d like to meet with the head of an American Indian tribe to try to ease the tribe’s concerns about the project. But Kelcy Warren, the CEO of Energy Transfer Partners, told The Associated Press that the company has no alternative but to maintain its plan for the nearly completed $3.8 billion pipeline, which would ship oil from North Dakota to Illinois. “There’s not another way. We’re building at that location,” Warren said. He disputes the tribe’s claim to sacred sites on the route. In October, a federal appeals court denied the Standing Rock Sioux Tribe’s request for an injunction to block construction of the pipeline. The ruling means that construction can continue near the tribe’s reservation in North Dakota, but the tribe vowed to continue its campaign against the pipeline. Archambault, who hosted celebrity supporters actors Shailene Woodley and Ezra Miller at the tribe’s protest encampment Friday, is willing to meet with Warren but that he doesn’t think it would change the situation. Both sides are calling for President Barack Obama to get involved. “We want to see the pipeline rerouted to ensure that Native Americans’ concerns are heard and respected,” said Jamie Williams, president of The Wilderness Society, a nonprofit advocacy group. “We want President Obama to fully engage with the Standing Rock Sioux nation on this issue, and we hope this will set a positive example for future federal relations with sovereign tribal nations to the benefit of all Americans,” said Williams. “We applaud the Corps of Engineers’ decision to consider rerouting the pipeline,” he said. North Dakota Governor Jack Dalrymple blamed the federal government’s indecision over granting a water crossing permit for the increasing unrest.